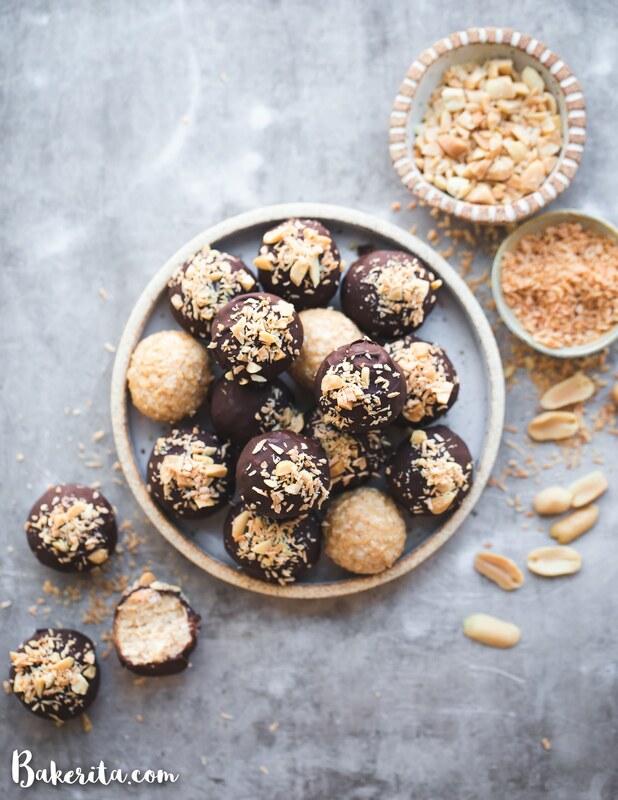 Make these Peanut Butter Coconut Truffles with just 6 simple ingredients! They are infinitely customizable to your tastes. With a thin chocolate coating and a melt-in-your-mouth texture, these gluten-free, vegan, and keto truffles will become your new favorite snack or dessert. These Peanut Butter Coconut Truffles lasted a measly two days in my house before I immediately made more. I made these while standing in the kitchen late at night, without any fresh fruits to work with and limited ingredients in my pantry, but dying to create something new. I ended up grabbing jars of stuff, mixing it together, and seeing what happened. First, I was stirring together peanut butter and coconut butter, knowing the coconut butter would firm up at cooler temperatures, making the mixture scoop-able. Then I mixed in chopped peanuts and coconut for some texture. After a stint in the fridge, the texture was just what I imagined: firm, but scoop-able, almost like a chocolate ganache. I rolled portions of the peanut butter coconut deliciousness into balls (after scooping with my favorite cookie dough scoop) and then dunked them in dark chocolate. I accidentally created one of my new favorite desserts/snacks/breakfast treats. 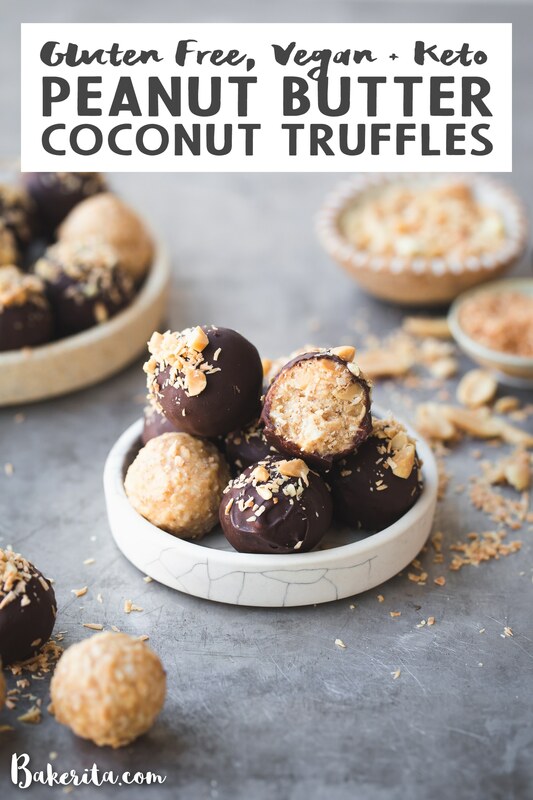 These Peanut Butter Coconut Truffles are to die for! The texture is firm but also melts in your mouth after biting through that thin layer of chocolate coating. For the coconut butter, raw can certainly be used – but I used some homemade toasted coconut butter I had on hand and the extra toasted flavor adds an extra dimension of tastiness to this recipe. The recipe is naturally keto, since there is no added sugar. You can use unsweetened chocolate or sugar-free chocolate to lower the amount of sugar even further. It’s also gluten-free, vegan, and refined sugar-free. The recipe can also be paleo if you use a different nut butter than peanut butter. This recipe is also infinitely customizable. You can use your favorite nut butter or flavored nut butter to change the taste of the recipe. I made my second batch of these with Salted Eggnog Cashew Butter from Ground Up PDX and it was sensational! I just subbed in chopped cashews for the chopped peanuts and it worked beautifully. Get creative, and enjoy these scrumptious little truffles. 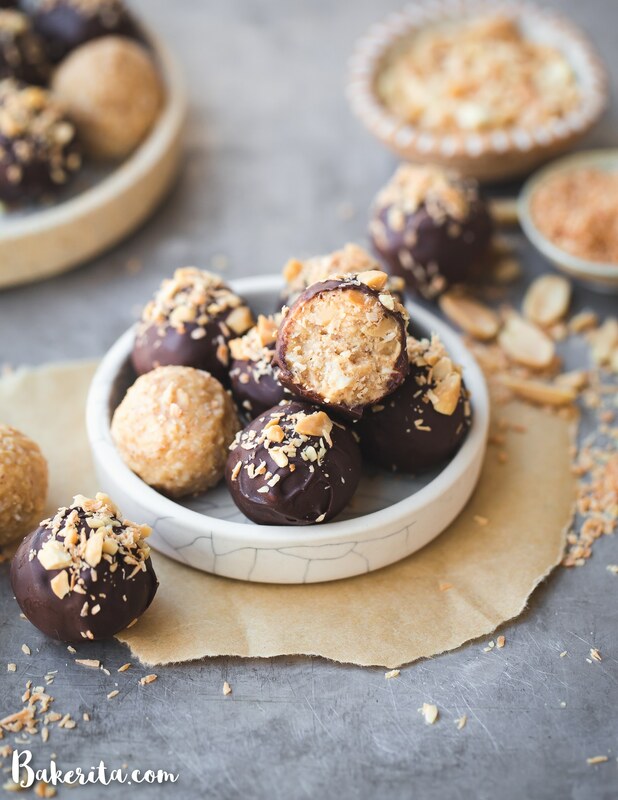 Peanut Butter Coconut Truffles are made with just 6 simple ingredients and are infinitely customizable to your tastes! 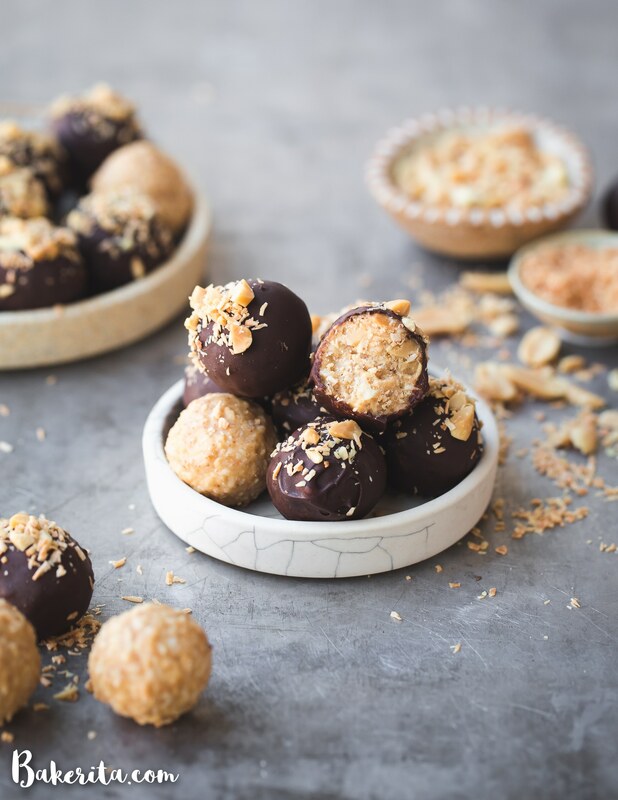 With a thin chocolate coating and a melt-in-your-mouth texture, these gluten-free, vegan, and keto truffles will become your new favorite snack or dessert. In a mixing bowl, stir together the peanut butter, melted coconut butter, coconut, chopped peanuts, and coconut sugar and salt, if using. Taste and adjust amounts of coconut sugar and salt if desired. Place in the refrigerator until firm, about 1 hour. Use a cookie scoop (this one from OXO that I used holds 1.5 tablespoons) and scoop balls of the chilled peanut butter mixture onto a plate or baking sheet. Roll into a ball with your hands and repeat until all of the peanut butter mixture is used. Place in the refrigerator or freezer briefly while you melt the chocolate. To melt the chocolate, place the chocolate and coconut oil in a microwave-safe bowl or liquid measuring cup. Microwave for 1 minute and then stir. If not fully melted, microwave in 15-second increments, stirring between each, until completely smooth. 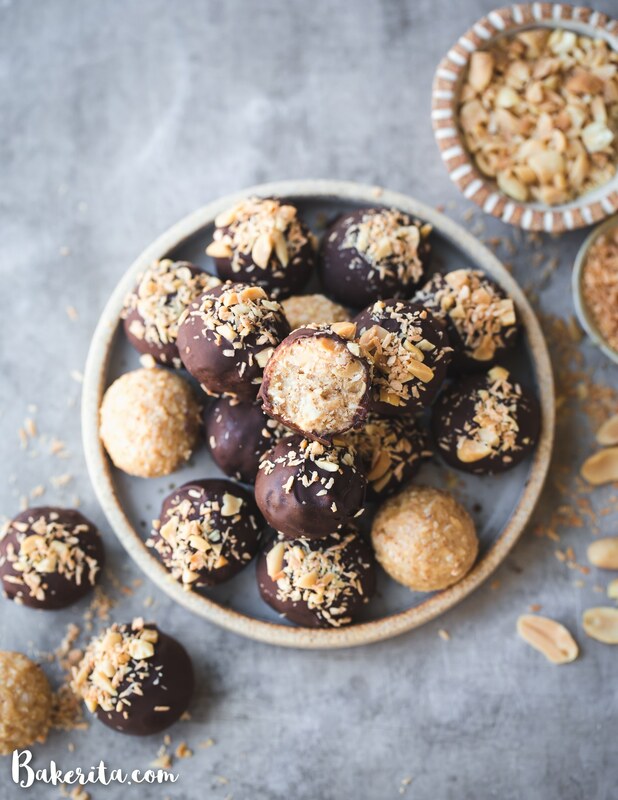 Using a fork or dipping tool, dip each peanut butter coconut ball into the chocolate, letting any excess chocolate drip off before placing on a parchment-lined plate or baking sheet. Garnish with toasted coconut and/or chopped peanuts, if desired. Refrigerate until chocolate is firm, about 10 minutes. Store in the refrigerator for up to a month. Nutritional info is calculated using unsweetened chocolate and without the coconut sugar. Just by seeing these pictures , I got cravings. Chocolate is love for everyone. Thanks for sharing such a mouth watering recipe. I am dying to try this out . Thank you so much for sharing this wonderful work of your.